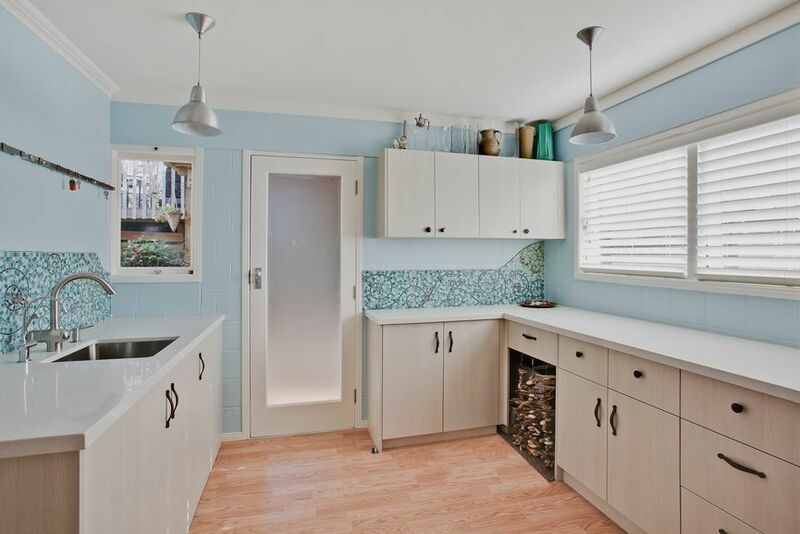 The old kitchen in this mid-century style house was unattractive and impractical. And the dining area was squeezed into a space that could barely fit a small table for four. The new kitchen had to be as large as the space would allow, with loads of storage for a serious cook with a penchant for gadgets and cooking utensils. But walls that couldn’t be moved limited the design options. The solution was to relocate the dining area. An extra wide hallway offered the needed space to add a dining area at the back of the living room, creating a lovely flow through to the new kitchen and on out to the new deck. To visually tie all the spaces together, the kitchen cabinets were built of oak and stained to match the dining room table. Every detail has been meticulously planned for maximum storage without a millimeter of waste. 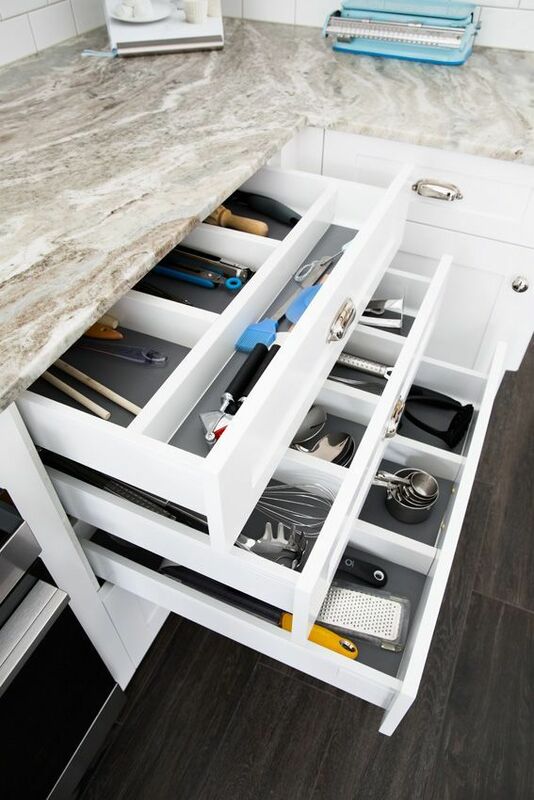 Special storage inside the cabinets includes a chef’s pantry, spice racks, custom utensil dividers and a cleverly hidden rack for hanging skillets. A large Falcon range is in constant use but is visually upstaged by the custom mosaic splash back. But the most important feature of all is the large center island which provides loads of work space, cabinet storage all around and widens at the end for a comfortable eating area. What looks like a second kitchen is actually a large laundry, with room for a hidden freezer and lots more storage space. 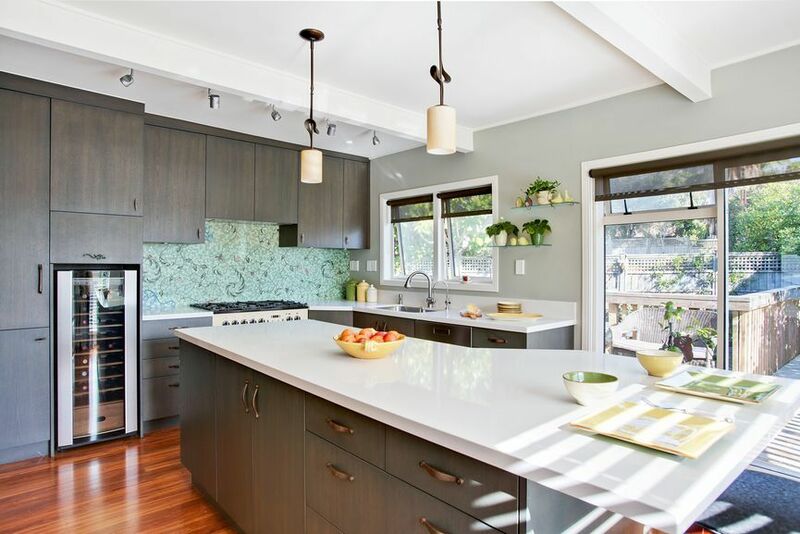 With a place for everything, and everything in its place, great appliances, loads of work space, indoor outdoor flow and a beautiful look besides, this owner couldn’t be happier with this renovation that enhances the perfect modern home.